Providing site mixed concrete and screed in Leicester and Rutland. No wastage and you only pay for what you take. 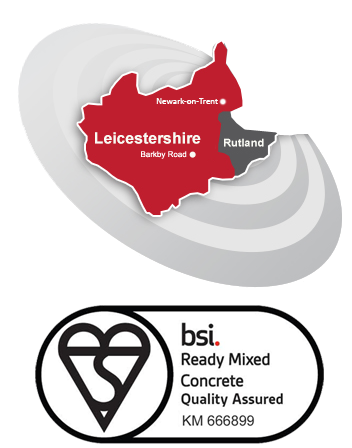 Wright Mix are BSI Accredited to BS8500 and BS EN 206, so you can be assured of the quality of our product. Wright Mix specialises in the supply of ready mix concrete and screed via our fleet of mobile volumetric mixers. We are the leading supplier of onsite ready mixed concrete and screed in the Leicestershire and surrounding areas, providing you with a first class service operating from our site at Barkby Road, Leicester. We operate and control the quality of our concrete to the highest level, with routine calibration and yield testing of our machines right through to concrete cube testing. All of our screeds are produced using the highest of quality raw materials. Both of our sites use only ordinary Portland cement. You can be assured of getting the best quality footing concretes. Our concrete is a flexible, durable and economical product. Our concrete pumps can cover larger distances, and can navigate obstacles to access even the most hard-to-reach sites. Wright Mix is the leading supplier of onsite ready mixed concrete and screed in the Leicestershire and surrounding areas, providing you with a first class service operating from our site at Barkby Road. In addition to this site we have a re-load site located on the A47 at Skeffington, giving us capability to supply the surrounding areas of East Leicestershire, Rutland, Nottinghamshire and the Lincolnshire borders. With the capability of supplying projects requiring volumes from 1m3 to 100m3 from our volumetric mixers, we can cater for the small domestic user up to the large commercial projects. With our on-site machines deliveries could not be more simple. Remember we will only give you what you want, so you only pay for what you have!! With our professional operators and large fleet, this allows us to offer every customer a flexible delivery time and multiple mix designs on the same delivery, leaving you with peace of mind and control. Our services also include, technical advice, concrete pumping services and aggregate transport. For ready mix concrete and screed in Leicester and Rutland, give us a call today.